Hi! My name is Bosco. I'm a 6 year old El Cajon Special! I'm part Boston Terrier and part Pit Bull. You might not be able to tell from my cushy-looking surroundings in this picture, but I had a rough start in life. 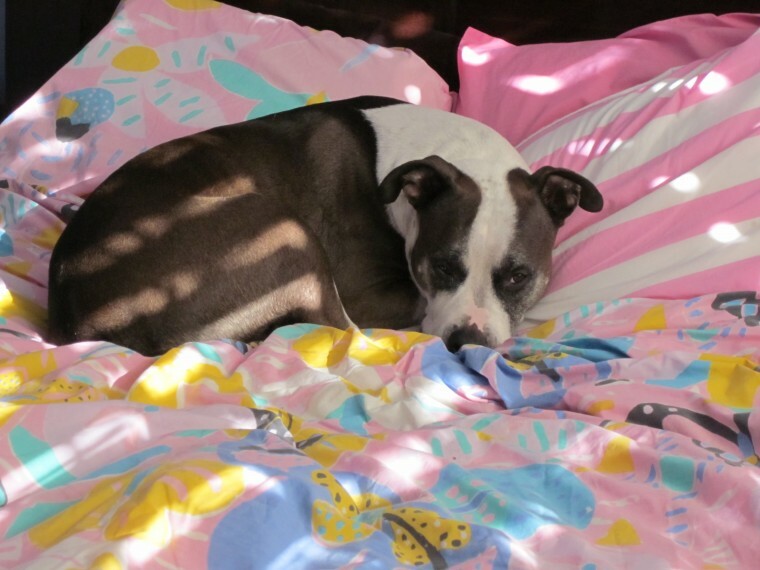 I was dumped at a veterinary clinic in El Cajon as a puppy by people who couldn't afford to surrender me to a shelter. 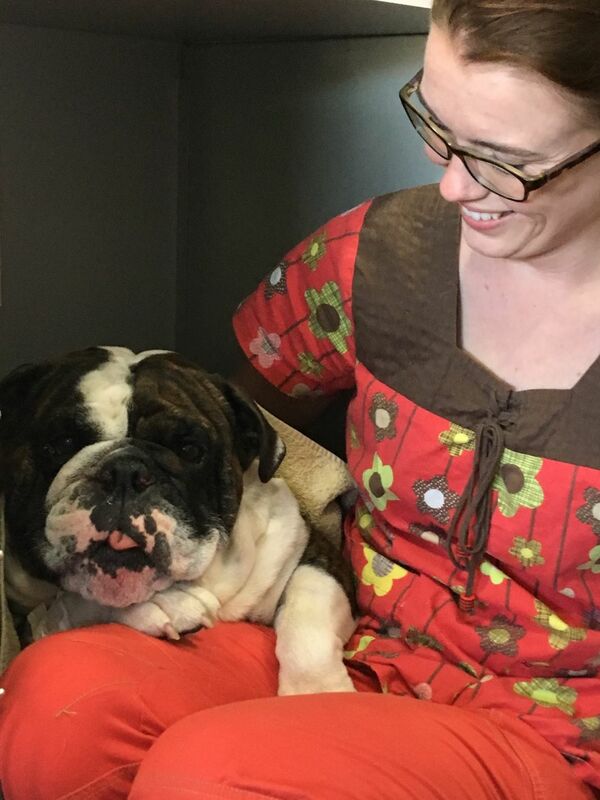 My mom, Dr. Heidolph, saw me, fell in love with me, and rescued me. Everyone who meets me is surprised that I'm such a sweet Pit Bull, but I wish they knew that we are a really misunderstood breed. I'm such a loyal boy that I would do anything for my mom. Fortunately, all I have to do is be me, but other Pit Bulls and Pittie mixes are forced to do things that we don't want to do, just so we can please our people. Still in our hearts every day, sweet Bosco passed away in 2016 after a valiant battle with a nasal tumor. Coco soaking up the sun (left). Coco comforting a patient - Maili - on the VetBus (right). Coco's femur was broken by a hit & run car in 2012. She was left by the side of the road in the desert with no pain meds & no food or water for 3 days before animal control brought her to a shelter. When her owners were told about her injuries, they refused to fix her leg, but rather told the veterinarian to kill her. The veterinarian refused, but instead sent them to the shelter, where she was surrendered. The Boston Brigade Boston Terrier rescue of San Diego was notified, & organized her transportation to San Diego and paid for her orthopedic surgery. She has been with Dr. Heidolph since the end of 2012, lightening every day with her confident & playful demeanor. She loves being on the VetBus, playing & mothering kittens, or comforting cats and dogs who have had procedures. 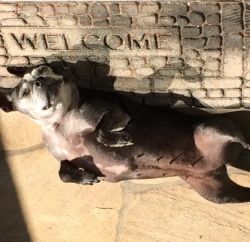 Coco enjoys weekly rehab (cold laser therapy, massage, & shock wave therapy) & swim therapy at Tsavo's Canine Rehab in Del Mar & has recently received & benefited from PRP therapy on the VetBus for her elbows & shoulders. She will turn 13 this year! Jo Tootell, RVT, prepares the VetBus surgery suite for a spay/neuter clinic with Coastal German Shepherd Rescue in San Marcos May 22, 2012. Anna Brown, RVT (Registered Veterinary Technician), and cat whisperer, gives some TLC to a kitty on the VetBus during the NatCat spay/neuter clinic in Spring Valley May 10, 2012. Anna has worked tirelessly rescuing cats and has worked for over a decade with the FCC (Feral Cat Coalition) to help reduce San Diego County's feral cat population. Josh Millerd, RVT, and cat whisperer, gives love to this sweet, sedated cat in preparation for his dental procedure on the VetBus. Josh has worked for decades in the field of veterinary medicine, providing compassionate and skilled care to his patients. 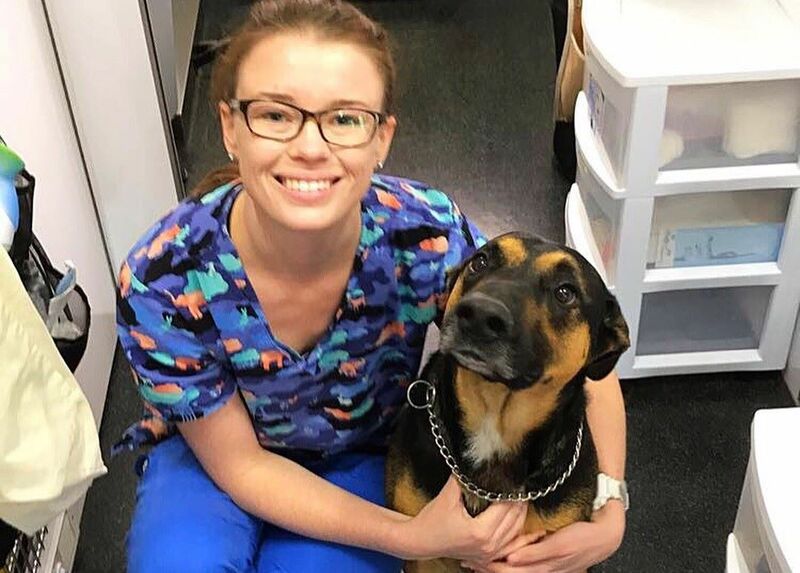 Kathy Dawson , Veterinary Assistant, holds her rescued German Shepherd/Pitbull mix - Hurley (left) as we prepare him for his professional dental cleaning on the VetBus. Kathy has worked in shelters for years and is training to help animals in emergencies and disasters through the Animal Rescue Reserve, a division of SDHS. 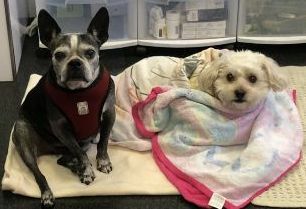 Bosley (right) being supervised and comforted by Kathy after his neuter and nose job surgeries. He had abnormally narrow nostrils (stenotic nares), which we repaired to improve his breathing. 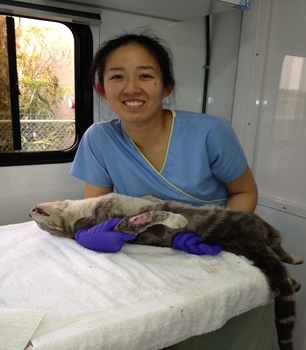 Annie Wu, RVT, holding an anesthetized feral cat during the VetBus' Feral Cat Coalition Clinic in Chula Vista, April 22, 2012. We treated this cat's bite wound abscess. 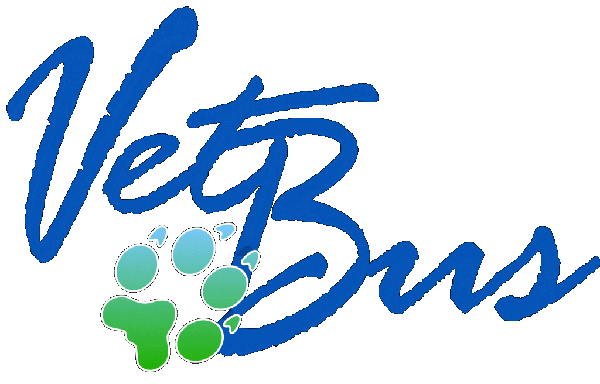 Although these clinics emphasize spays and neuters, we also treat injuries such as bite wounds and abscesses, when needed, with surgical intervention and/or antibiotic therapy. Leah Burke, veterinary technician (left), and Jo Tootell, RVT, (right) prepare the VetBus for its inaugural clinic at Sunshine Gardens Nursery in Encinitas on April 18, 2012. Anna Brown, RVT (Registered Veterinary Technician), and cat whisperer, gives some TLC to a kitty on the VetBus during the NatCat spay/neuter clinic in Spring Valley May 10, 2012.